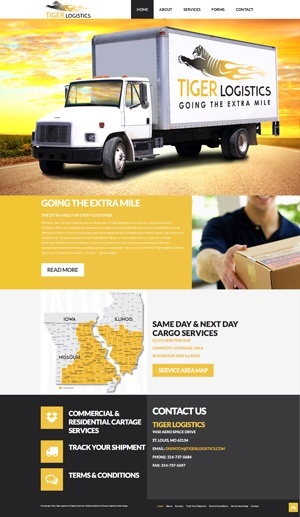 Blue’s ArtHouse is very proud of our most recent website creation for Tiger Logistics, a cartage freight transportation company serving Missouri and Illinois. The front page slider features Blue’s ArtHouse custom imagery. Tiger’s fleet was in production at the time of website development, so we worked with the client to select appropriate stock images of trucks, then Blue’s ArtHouse added Tiger’s logo and background imagery for some eye-catching results!